12:08 AM high 3.6 ft.
6:36 AM low 0.3 ft.
12:31 PM high 2.7 ft.
6:26 PM low 0.4 ft.
How to reach: To reach the tidal bench marks from Moorehead City, from the U.S. Highway 70 bridge over Beaufort Channel west of Beaufort, proceed west on U.S. Highway 70 for 0.3 km (0.2 mi) to the road leading to Pivers Island, turn left and go 0.6 km (0.4 mi) to Duke Marine Laboratories. The bench marks are along the road leading to the laboratories and on the grounds. 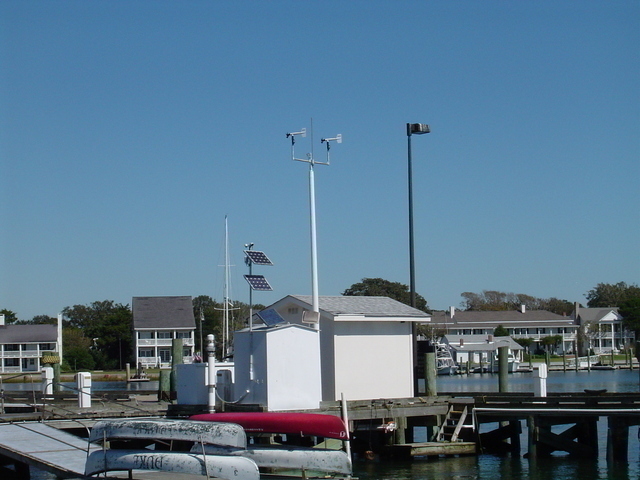 The gages are at the Duke Marine Lab dock.